I was a student in a medical college in Delhi but dropped out in the fourth year due to health-related reasons. Later I went abroad to do a course on psychology. At present, I am studying law and have joined a law college. It has been a great experience. Since 1994, I have been attached to an NGO - The India Vision Foundation. Being the daughter of a dynamic personality like Dr Kiran Bedi has ensured that I get a holistic picture of life around us. I would say that I am exposed to a much wider spectrum. We have been working with street children. I have always urged them to discover, innovate, develop some talent/core expertise by doing any kind of work - rather than wasting their time. We have given them opportunities to indulge in doing things they like or enjoy doing. It was then that I developed this concept of the Original Mind awards. As chairperson of the awards, I feel very involved and passionate about the awards. The award is for all those who make an effort to create, innovate, invent and discover. We started this journey of tapping hidden potential with school children but from this year we have decided to increase the reach and expanse if this award for one and all. We called for nominations to the awards function that will be held in October 2003. Anyone with a thinking mind is eligible for participating and sending their nomination. We are seeking corporate support and sponsorship. As this project/award is very close to my heart and is more like a mission, I would personally like to request people to come forward and support this movement. Anyone, who wants to, can come and join me in this effort of tapping, recognising and promoting hidden talent. More information can be obtained from the website: www.originalmindaward.com and www.indiavisionfoundation.org. I have also started Pavitrata Creations Pvt Ltd; my television serial, Galti Kiski, is aired every Wednesday on DD-National at 10.00 pm. The serial is based on the true real life stories adapted from the book What Went Wrong written by Dr Kiran Bedi. The serial is a co production between Pavitrata Creations and Sri Adhikari Brothers. I hadn't really thought of getting into TV production. One fine day, I was sitting with my mother and we were discussing her book. Suddenly, I asked my mother: "Why don't we make a TV serial based on your book. It is the best medium to sensitise people." I spent the next two years of my life searching for people who could help us realise our dream. It was during this time that I realised the power of "money". Finally, God was kind enough to send the Adhikari Brothers to our rescue. They decided to co-produce the series with me. They took the entire "production" responsibility off my shoulders and allowed me to concentrate on the creative aspects. We are not creating any revolution but merely trying "wake up people". So many people in this country spend a lot of money on unnecessary things - they can give a thought to others who are not so lucky. Our message is very simple - change yourself and you have done your bit. Those viewers "who are moved by these real life stories and people who have been victimised and wish to help in any way" can contribute to the India Vision Foundation. I have always been closely identified with my mother - who is a strong personality. 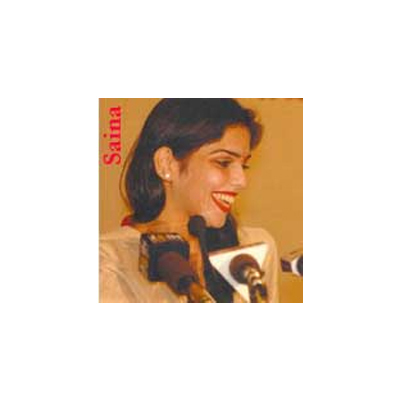 But, I wanted to discover the true Saina as a woman and as a human being who has a separate identity. I wanted to create a different image of "who I am". Through my work, I try to express myself. Another aspect is my upbringing - a legacy passed on by my parents. It has been so idealistic and utopian that I get "shocks" when I am exposed to the "real" world outside. Everything in this world is contrary to the values espoused by my mother. The challenge is to ensure that I don't deviate from the values and the philosophy that has been a part and parcel of my life. My biggest success lies in the fact that I have managed to have my feet "firmly grounded" without running haywire. I personally feel that I am on my way to create a separate identity for myself. My only failure is that I let my heart rule over my head. It isn't a sound quality to possess in this world. I am not worldly wise. Media needs to be more real. At present, media seems to be like an "opium dose" - assisting people to break away from the real world into a fantasy world. There is too much of glamour and escapsim. Media must bring people closer to life. It must remind the "page three" types that there are people around them who are struggling to survive; to make both ends meet! It is a beautiful medium to convey thoughts to the masses. I love the possibilities that emerge from this lovely medium. I love to paint, write and read. I enjoy listening to music and indulge in activities that are of a spiritual nature. I love children. I love any kind of activity which is "sentimental". I see myself as growing older in a graceful way; and of course, more mature as a woman. I suppose that I shall be happily married. I hope that Saina continues to have her "power to give and serve". 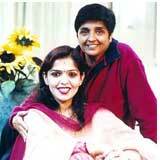 By then, people will be nice to me because I am Saina - not Kiran Bedi's daughter!